When I made the lamb tagine for Easter, I misread the recipe and thought that carrots would be in the stew. I realized this mistake once the stew was already on the stove, and since fennel was the only real vegetable in the tagine, I really wanted those carrots somewhere. 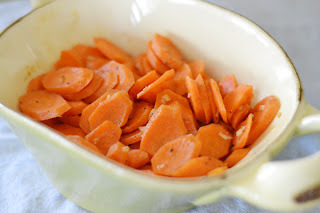 I quickly googled for Moroccan carrots and found this simple recipe on Epicurious. Thank goodness! They were quick, simple, and flavorful. The spices worked well with the simplicity of the tagine, and everyone loved them, including my little guy! These were best after sitting for a little while. I made them about an hour in advance, but after reading reviews, a lot of people recommended waiting at least two hours. I think next time I might cut back slightly on the oil, but the recipe below reflects the original measurements. This served our small family, so double this if you are serving larger appetites. Steam the carrots for about 3-4 minutes, or until they are just beginning to become tender. In a skillet, heat the olive oil in moderately low heat and add the garlic, stirring for about 1 minute. Add the cumin, cinnamon, sugar, cayenne and carrots and saute for about one minute or until the carrots are well-coated with the spice mixture. Add the lemon juice and salt and pepper to taste. Transfer the carrots to a bowl and let come to room temperature. These carrots sound delicious! I love all of the spices going on! Can't wait to get some carrots in our CSA this year! Well don't these carrots sound nice, I will have to try these next time I am doing a nice dinner. Thanks for sharing. Peggy, no kidding! I'm counting down the days until we pick up our first CSA basket! Medifast, welcome! Let me know how they turn out! This looks so simple to make...healthy...and beautiful colors! Thanks for sharing! I don't know if I've ever been to your blog before, it's just LOVELY! Brilliant! Thank you for the perfect accompaniment to my grilled spatchcock. Nicholson, Giorgetti & Magrini just about all experienced the submit the woman's style; Nicholson about the replica chanel bags, Giorgetti & Magrini on her behalf inside. The actual darkish shades from the wooden tend to be stylish, providing the woman's an old-fashioned however magnificent attractiveness that's not even close to out-of-date but instead desired through individuals with the flavor with regard to historic artefacts. Creole is really the louis vuitton replica sale luxury boat rental as well as artwork, concurrently! Creole is actually driven through two 450 hp MTU diesel-powered motors, producing the woman's an extravagance engine luxury boat. The entire motor energy result with regard to luxury boat Creole is actually nine hundred as well as your woman may achieve rates of speed associated with fourteen. 5 hublot replica sale. Smooth sailing pace with this luxury boat rental is about 10 knot as well as your woman retains 6, 816 gallons associated with energy as well as two, 483 gallons associated with drinking water. So far as people, this particular sixteen team extremely luxury boat may easily support close to 8 people for just about any provided rental. Picture the actual picture possibilities using the stunning organic searching wooden on your luxurious luxury boat rental get away! Not vintage inside your preferences? Take a look at the cartier replica associated with engine luxury boat charters, speedboat charters and much more! Beam prohibit is recognized as one of several manufacturers associated with shades consumers may actually adore. The actual Aviators tend to be one among their own earliest very long time kinds which were hublot replica sale launched with regard to mma fighter pilots.